We were due to meet the Roadfooders at 11 am, and we somehow managed to pick the one taxi in all of Manhattan that wasn’t in any big hurry. He lazily meandered along, pointing out local points of interest as the clock ticked. We finally made it to Katz’s about 20 minutes late, still half asleep. It was great to hang out with everybody – Ruby Rose is so much fun, Traveling Man, Wandering Jew and Lexi never stoppped laughing, and Aleswench, Alesrus and family were charming. I somnambulistically made small talk and ordered a half-pastrami, half-brisket. Our friend John, who lives upstairs and is addicted to the garlicky hot dogs, also came down to join us. Our pastrami sandwich was on a very mild seedless rye, almost more of a wheat bread. 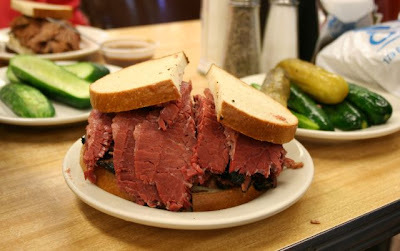 The pastrami was made from thick slices of flaking brisket, none of the thin, chewy, overly peppered strips that pass themselves off as pastrami. It was like tasting it for the first time. The brisket was good, but I have to confess that I think my brisket is better. 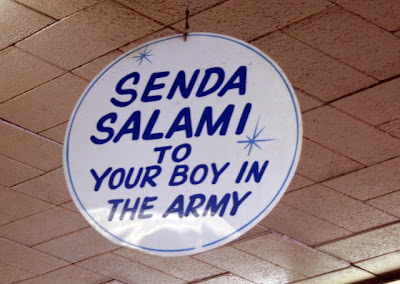 Really, they might as well serve only pastrami. It’s just not fair – the other sandwiches might as well take their ball and go home. Aleswench asked me how it compared to Langers. 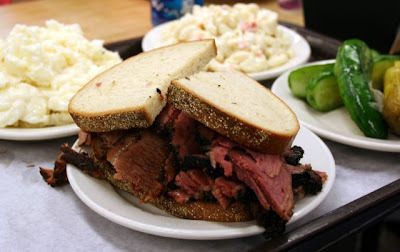 Still lost in a playground metaphor, I told her, “Langer’s pastrami would go crying home to its mommy.” Katz’s has a light hand with the mayonnaise in the potato and macaroni salads, but the best side were the pickles. The uncooked “counter” pickles are always a special treat, but no match for the garlic dill. Afterwards, Lexi led us down the street to Yonah Schimmel’s Bakery for knish, which was a real find. I picked up a mushroom, sweet potato, and blueberry to go. I couldn’t believe how heavy the bag was. Later, when I sampled them I discovered the dough was paper-thin, and although they would have been better warm, they were peerless. The blueberry knish was more like a hearty blintz and made me want more. Our first stop was Alleva Dairy. Wheels of cheese as big as tires, arancini and giant salamis soon had John on board. I picked up prosciutto bread and homemade mozzarella, although alas, no little knots – only braids. The gelato sign at Cafe Roma beckoned. The boys ordered pastries and I sampled a little pistachio gelato, which was good, but not fantastic. 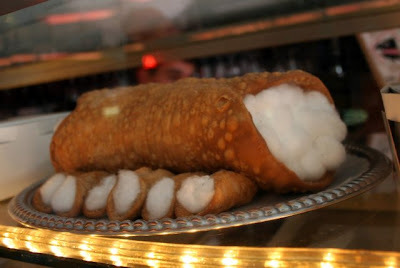 But the cannoli – heaven opened up and angels sang. Now THAT was cannoli! Across the street I noticed a stand called “Vinnie’s Nut House”. Unfortunately, they did not have any nuts, “You see, we are new.” They did have buttons with the pope on them and giant slabs of toronne nougat candy. The nougat candy was rich with honey and roasted pistachios. Next we hit up Caffe Palermo, home of Baby John, the cannoli king. “Baby” John Delutro had a very intense accent, enough to make my companions wonder if he was milking it. I have to say that their cannoli was no match for Cafe Roma’s cannoli. However, they did have one treat that Bob has been waxing rhapsodic about ever since I met him. 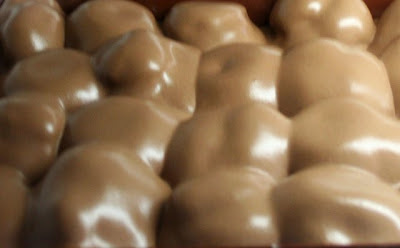 In Italy he had once eaten profiterole filled with cream and buried in chocolate pudding. And he has never forgotten it. It was a little messy for street food, but so worth it. We noticed cheese-topped garlic bread on one of the outdoor cafe tables and had to go inside and order a basket at Il Fornaio. John and I split the gnocchi, which was heavy and dull, and Bob had a caesar salad that he loved. The bread was delicious – I am a sucker for cheesy bread. The crowds at Ferrara drew us over. The long, shiny cases held row after row of decadent treats. Miniature pastries and cookies were displayed in rows next to fruit tartlets glistening with berries. A man in front of us asked, “Don’t you have anything smaller?” Bob picked up miniature biscotti for his colleagues at work, and I picked up a veritable doll museum of teensy delights. We started heading back towards Bleecker and passed a churchyard. I wondered if that was where the body of Mother Cabrini lay in a shrine. It wasn’t, but what is one of my trips without a photo of a cemetery? We walked through The Grand Italian Market, but we were too stuffed to take advantage of their beautiful pizzas. We passed DiPalo’s. By now I had given up on the little mozzarella knots, and as Bob said, it was about the journey. I wandered inside and was deterred by the long line. I wandered back outside, where John and Bob encouraged me to go ahead and wait. Louis DiPalo was giving cheese tastings and expounding on the merits of each cheese. The attention this store is famous for was nice, but a little frustrating when you are waiting in line and your feet are starting to hurt. I have to say, this was the one place in all of New York that I experienced true comraderie amongst strangers. In other places, when a group of strangers is thrust into a similar situation, they start to chat – but not in New York. People stood silent and steely-eyed as elevators closed on strangers and refused to meet my eyes while waiting for the train. At DiPalo’s everyone opened up and commiserated about the line, “Oh, this is the best time to come. 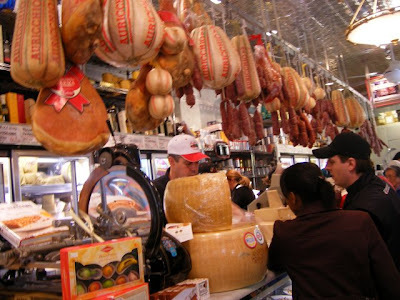 This is nothing.” One customer said his father insists on making DiPalo’s his first stop in the city and takes home and entire soprasetta in his suitcase. I didn’t end up with Louis, but scored Sal instead. I asked, “Culatello isn’t what I THINK it is, is it?” That made Sal decide I must be a wise guy and he told me joke after cheesy joke. “How do you kill a circus? Go for the juggler!” (The latter joke only works when told in a New York accent). I picked up the recommended soprasetta, wine cheese, homemade mozzarella as well as some Piave Vecchio and homemade ricotta that I brought home in my suitcase. Although I was tired at the time, my visit to DiPalo’s is one of my fondest memories, a moment where I really felt connected to the city. We wandered through Chinatown, where every other storefront advertised foot and back massage. I had started complaining about my feet, so I was ferried into the basement massage parlor. It was kind of strange that with 10 young girls there, the one middle-aged man took me. After we were behind the curtain and already started the massage, he asked, “You’re here for massage?” I wondered what else I would be there for. But Bob and John didn’t report anything unusual from their masseuses, so it must have been a language thing. At 30 bucks for 45 minutes, it was one hell of a deal. Passing by a mission, I noticed a strange bible quote on the front of the Jesus van. As I walked over to take a picture I barely missed stepping on a hypodermic needle. Now this was the gritty New York I had expected. We headed over to Morrison Hotel, an art gallery in the space that formerly held CBGBs. There was a display of rock photography that was just amazing. After a quick latte across the street, we bid John a fond adieu and went back to our room with arms full of goodies from Little Italy. This entry was posted in Bakeries, cemeteries, Italian, nyc. Bookmark the permalink. My cover is finally blown! I don't mean this in a bad way, of course! Ethical concerns aside… I just hope that as memory gets less expensive, the possibility of copying our brains onto a digital medium becomes a true reality. It's a fantasy that I daydream about all the time.